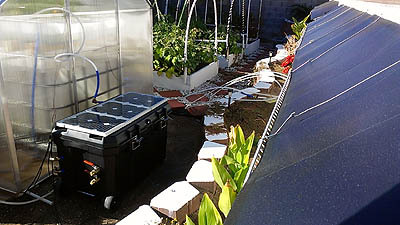 Here the HOPE system is being used to power an aquaponics system. It filters and circulates the water within the system providing an all natural" off the grid" grow system for vegetable grow stations and fish raising. By hooking into more solar panels you're able to increase the power produced and provided by the system for your specialized needs as they come up. Power Sources: Power is provided by a 30W independant solar panel located on the lid of the system. Additional power sources can be added to the system like additional solar panels. Battery chargers can be also be used to charge batteries indoors inbetween uses. For off grid living, in a less then sunny enviroment, one can use other alternative power generating sources like PMA(Permanant Magnetic Alternator) to provide battery recharging. Wind generators are another source for charging up the batteries. Having multiple recharging options is key when you are faced with long term energy loss or if wanting to become totally self sufficient. Versatility Power Sources: The back of the HOPE system has various power outlets for all your power needs. 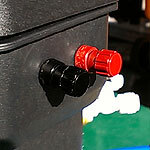 The unit provides screw connectors for additional solar panels. Two cigarette connectors are also provided for any adaptors. A connection is also provided for direct 12V DC connection. Power: The HOPE system has it's own built in power inverter. This allows you to convert the stored up electricity from the sun or other power generating source and converts it to useable power. Now you can run your tv, computer, lights or anything else needed in a no powered enviroment. UV Purified: UltraViolet purification uses a UV light source (lamp) which is enclosed in a protective transparent sleeve. The lamp is mounted such that water passing through a flow chamber is exposed to the UV-C light rays. When harmful microbes are exposed to the UV rays, their nucleic acid absorbs the UV energy, which then scrambles the DNA structure of the organism. The cell is rendered sterile and can no longer reproduce. 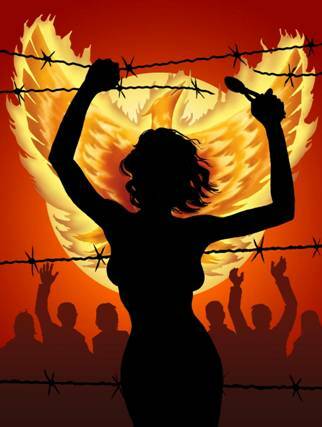 The cell is now considered dead and is no longer a threat. UV has a 99.99% rate of purification. RO Filtered: What is Reverse Osmosis (RO)? Reverse Osmosis is a process in which dissolved inorganic solids (such as salts) are removed from a solution (such as water). This is accomplished by household water pressure pushing the tap water through a semi permeable membrane. The membrane (which is about as thick as cellophane) allows only the water to pass through, not the impurities or contaminates. These impurities and contaminates are flushed down the drain. This water in a servival situation can be recycled through the system again or used to water plants, flush toilets, wash cloths and any other water sources. The waste water from the system is actually safe to drink as it's already been passed through all the other filters that typical water purification system stop at. RO is what you can call the best of the best with nothing but pure water. Power X 2: Unlike anything else on the market today, HOPE uses two "on demand" pump motors to power the system. We use only the best motors on the market Shurflo pumps. Having two pumps allows you to filter water and pump water all at the same time. It also allows you to hook up hot and cold water to allow shower hookup and washing machines. 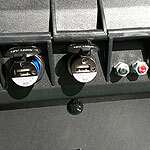 Although t he HOPE system has it's own power capabilities there are various other means to charge the units batteries. One form is to attach a PMA(Permanant Magnetic Alternator) to a stationary peddle bike. Other options are wind power or hydro. 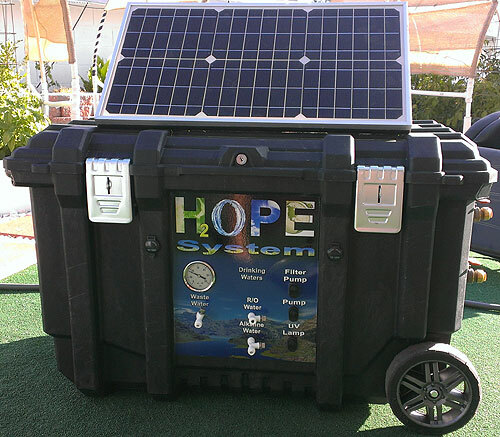 Portable: The HOPE system allows you to take it on the go for a weekend camping trip or to your cabin in the woods for year round service. It's small enough to fit in the back seat of a small car so no truck is needed. The all season construction and water tight components allow you to leave the unit outside in the elements. Your imagination is the limit to how you set up this power unit to make it do what you need it to do. The possibilities are endless and your ability to utilize the system will be to your advantage for total off grid living. 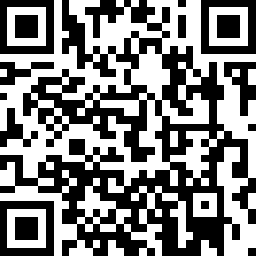 Find more information on the H2OPE System on our web site. 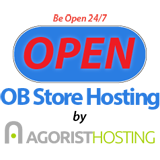 Online you can find more information on the systems specifications and purification rates.